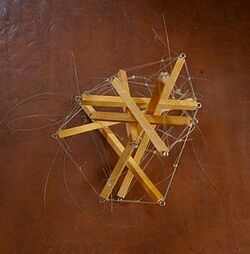 Read here about tensegrity structures composed of nine struts, part of a series of pages organized by strut count. A t-prism can be constructed with 9 struts. The tensegrity simplex is the 3 strut construction, often called the tensegrity tetrahedron. Most 9 strut tensegrities are constructed by varying the 3 strut simplex. A mast can be assembled by repeating the 3 strut module 3 times, or each strut of the simplex can be tripled, yielding a 9 strut construction. This page was last edited on 25 September 2018, at 09:54.